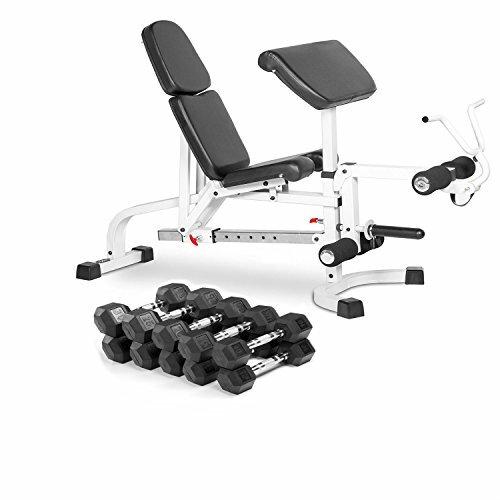 XMark FID Weight Bench with Leg Extension and Preacher Curl XM-4419-WHITE will effectively build and strengthen your body in flat, incline, and decline positions. Multiple adjustments allow you to work your entire upper body as well as your lower body and abdominals (in the decline position) in a variety of positions and angles. Attachments included are a dedicated removable preacher curl with curl bar catch for bicep work and a removable leg developer for leg extensions and curls. Exceptional quality best describes XMark? rubber hex dumbbells. The one-piece high quality cast iron heads have been press fitted and welded to each handle. A tough, premium rubber casing made from virgin and recycled rubber covers each cast iron head. The chrome plated handles are ergonomically designed to fit comfortably into the palm of your hands. It is no secret?Mark dumbbells are higher quality. To reduce costs, all of our dumbbells are sold and shipped in pairs or sets. It is a lot cheaper to ship a pair dumbbells instead of singles. Save some money today. You will not regret purchasing XMark dumbbells. Our team will greatly appreciate your business. Thank you for choosing XMark. Eight adjustments from decline to full military upright position. XMark Fitness, Premium Quality, Rubber Coated Hex Dumbbells - 5 Pair: 10, 15, 20, 25, and 30 lbs. - Total 200 lbs.. Exceptional quality best describes XMark's rubber hex dumbbells. The one-piece high quality cast iron heads have been press fitted and welded to each handle.. A tough, premium rubber casing made from virgin and recycled rubber covers each cast iron head. The chrome plated handles are ergonomically designed to fit comfortably into the palm of your hands.. Thank you for choosing XMark.It is no secret...XMark dumbbells are higher quality. It is a lot cheaper to ship a pair of 30-pound dumbbells instead of two singles. Save some money today.. You will not regret purchasing XMark dumbbells. Our team will greatly appreciate your business.